These are upgrade performance injectors for the 94-98 12v. they are full injectors and come with new nuts and washers. Full body Injectors for Dodge Cummins 24v 1998.5-2002. Choose your HP needs. Adding injectors is a great way to increase power. NO CORE CHARGE! FASS Fuel Air Separation System, Lift Pump, Titanium Series, 95 GPH, Dodge, 5.9L. Cummins, Kit. Fits 12-valve engines only. Designed for stock to moderate horsepower modifications. Rated at 95 gallons per hour and backed by a limited lifetime warranty this Titanium Series lift pump is capable of supporting your Dodge Cummins 5.9L and 6.7L diesel engine with enough fuel for multiple fueling upgrades. Fits 24-valve engines only. Designed for stock to moderate horsepower modifications. FASS Fuel Air Separation System, Lift Pump, Titanium Series, 220 GPH, Dodge, 5.9/6.7L. Cummins, Kit Designed for super extreme high horsepower modifications. Fits 12-valve engines only. Designed for super extreme high horsepower modifications. FASS Fuel Air Separation System, Lift Pump, Titanium Series, 165 GPH, Dodge, 5.9/6.7L. Cummins, Kit Designed for moderate to extreme horsepower modifications. Supercedes the 150 GPH. Designed for 600-900 hp applications. 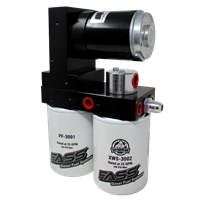 FASS Fuel Air Separation System, Lift Pump, Titanium Signature Series, 95 GPH, Dodge, 5.9L. Cummins, Kit. Fits 12-valve engines only. Designed for stock to moderate horsepower modifications. FASS Fuel Air Separation System, Lift Pump, Titanium Signature Series, 95 GPH, Dodge, 5.9L. Cummins, Kit. Fits 24-valve engines only. Designed for stock to moderate horsepower modifications. Fits 12-valve engines only. Designed for moderate to extreme horsepower modifications.